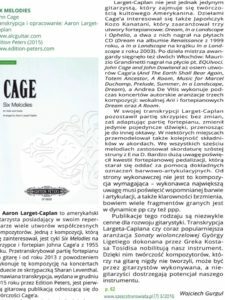 “Aaron Larget–Caplan is an American guitarist having in his repertoire a long list of works of contemporary composers. One of the compositions he has shown interest to was the Six Melodies for piano and violin of John Cage from 1955. A. Larget-Caplan has transcribed the piano part for the guitar und has successfully played this composition since 2013 with the violin player Sharan Leventhal. This transcription was released in December 2015 by Edition Peters and was the first published composition for the guitar regarding work of John Cage. Larget-Caplan is not the first guitar player involved in the work of the famous American musician Cage. The Japanese Kozo Kanatani was interested in the Cage´s work as well, he wrote three arrangements for piano: Dream, In a Landscape and Ophelia, two of them were released as CDs (the Dream as part of the album Renaissance from 1999; In the Landscape on In the Landscape from 2003). Two Italian artists got also connected to the work of the American avant-garde composer, Maurizio Grandinetti recorded on the EQUIvoci, John Cage and John Dowland even eight of Cage´s compositions (exp.) and Andrea De Vitis plays his own arrangements of three Cage´s compositions on concerts as the Aril for vocals and the Dream and the A Room for the piano. By his transcription A. Larget-Caplan was keeping the part for the violin without changes and has adapted the piano part changing the single sounds and transforming them to another octave. He replaced the components of the chords. In all of the six pieces he was using the scordatura of the sixth string from E to D. His big attention was given to the piano pedal marks, which he tried to translate by setting of exactly accents on tones. From the interpreter’s point of view this composition seems to be not so difficult, but the challenge is made up of in paying attention to tone and articulation and clarifying the sound then many of tones are played in pp or ppp dynamic.